ACBB: Tell me a little about your homebrewing history. 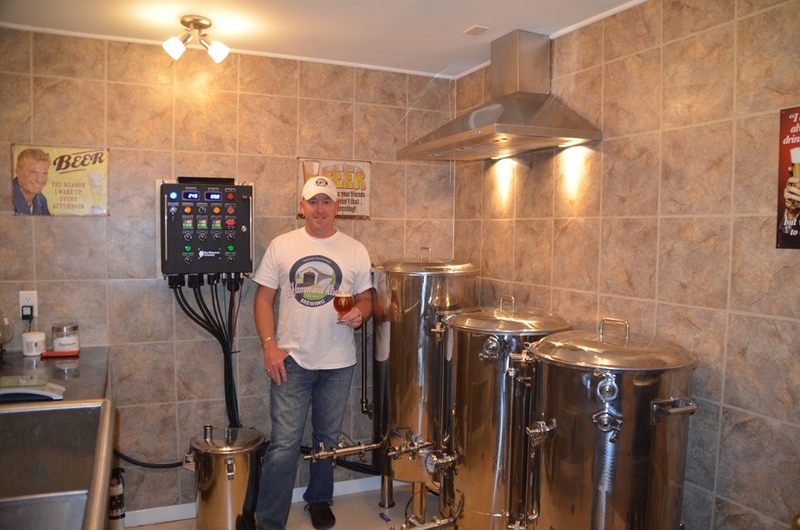 Shane Steeves: I’ve been homebrewing for approximately 23 years now. I switched over to all grain a few years ago and I haven’t looked back. I am also one of the brewers at Big Tide Brewing Co. in Saint John. Basically, there were two things that made me take the leap into brewing professionally. The first was that I enjoy brewing immensely, and I feel great satisfaction tasting a great beer that I’ve made from scratch. The second thing is that I’ve had a lot of positive feedback from friends and family which has encouraged me to open my own brewery. What steps have you taken so far getting everything up and running? Do you have any partners with the whole project? So far, I have my Federal Brewing license and the vast majority of my equipment. I have also applied for my provincial license, and when the construction of my brewery is finished (which will be soon), that will be finalized as well. I am doing this solo and do not have any partners involved in my brewery. I’m brewing on an all-electric 1 bbl (31 U.S. gallons) HERMS system. I’ll be capable of brewing approximately 115 litres of beer with each batch. I have a 45 gallon boil kettle, 40 gallon hot liquor tank, 40 gallon mash tun, two 40 gallon conical fermenters, and a 37 gallon brite tank. At first, I plan on dispensing my beer in 20 litre kegs only, and will be distributing them to a few pubs and restaurants in the Saint John and surrounding areas. My intention is to take it slow, so no immediate plans for bottling or growlers at this time. Do you already have some beer bars/restaurants in the Saint John area lined up to serve your beers? Yes, I currently have four local establishments that will be serving my beers on tap. My initial launch will be at the Saint John Ale House, but Bourbon Quarter, The Barrel’s Head, and The Shiretown Publicans will also be serving my beers. As of now, my intention is to list four different beers with ANBL: an IPA, an American Pale Ale, a West Coast Style Red Ale, and an Extra Special Bitter. I do plan on offering seasonals as well; for example, a Vanilla Porter in the winter months and a Hawaiian Pale Ale in the summer. Greg Nash [of Rockbottom and The Hart & Thistle in Halifax, NS] has been a very valuable source of information and assistance to me along the way. With the recent increase in the number of new breweries in Atlantic Canada, what will make Hammond River Brewing different from the rest? Hmmm, that’s a very good question. There are so many fantastic breweries in Atlantic Canada right now. What I will say is that I’m a hophead at heart, so I’ll be focusing mainly on West Coast style beers. Where do you hope to see Hammond River Brewing in two to three years? To be honest, I really haven’t put too much thought into where I see Hammond River Brewing in a few years. My biggest goal is to not to grow too big, too fast. Right now, I am just concentrating on making some fantastic craft beers for beer lovers in the Saint John and surrounding areas. I’ll see where everything takes me in the future and take it from there. Do you, personally, have a favorite beer style? Beer? Brewery? While I generally like most styles of beer, I definitely gravitate towards West Coast style IPAs and APAs. I don’t think that I have a favorite brewery, as there are just so many out there now that are producing such great beers. Absolutely. I’m a HUGE fan of Amarillo hops! I just love the orange citrusy flavour and aroma that it brings to a nice APA or IPA. Unfortunately, it’s not always an easy hop to get. That’s another good question. I don’t think that I could single out any one person whom I’ve learned the most from. It was Kellye Robertson (current brewer at Garrison) that first got me into all grain, so I need to thank her for that. But I’ve also learned an extensive amount from others online at Brewnosers, and also speaking to other professionals like Greg Nash. I’d say that it was traveling to Europe for the first time that really got me involved in craft beers. It really opened my eyes (and taste buds) to some fantastic beers of all styles. And it’s been virtually all craft beers for me since that first trip to Europe. We’re happy to welcome Hammond River Brewing to the fold of Atlantic Canadian Breweries, and wish Shane the best of luck in his endeavours! There are lots of beer geeks looking forward to when they can order his hoppy beers, so stay tuned to his Facebook site and this blog for further updates on Shane’s progress! Also, check out the Fundy Area Brewers page for more information on homebrewers in the Saint John area. ← Friday Wrap-Up – Fredericton Poutine Festival Being Held Nov. 10th, PEIBeerGuy Tasting at The Landing Tonight, New Beer at Hart & Thistle, and lots more!